Can’t wait till next weekend for the Red Hook Waterfront Arts Festival? Well unfortunately, you don’t have a choice. Kick off the day with beat box and spoken word artist Akil Dasan, a charismatic young musician who effortlessly combines intelligent lyricism and soulful singing with virtuosic musicianship. He wanders the planet with his guitar, a beat and an arsenal of stories. Akil’s freestyle and beat boxing abilities enhance his wide repertoire of musical genres. On Friday March 14th, teens from DTE’s TheaterWorks program at SBCHS went to P.S. 27 to watch Akil Dasan perform for elementary and junior high students. He performed songs that he had written and produced. One thing I liked about his performance was his beat boxing skills. He would beat box a famous song and all the children in the auditorium would start to sing the song. It was a nice sight to see. 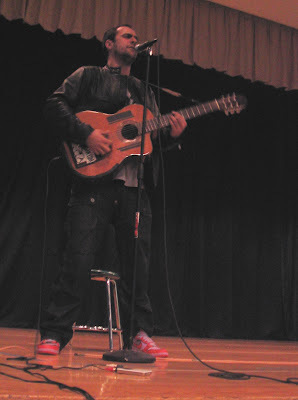 After the beat boxing, he rapped things he had written while playing the guitar. The only problem was that the kids started to lose attention during the more serious songs. After performing, he took questions from the kids in the audience. All of his answers had a positive message. One of the kids asked him how he learned to break dance. He said he learned it from youtube, and at first it was hard, but if you keep trying you can do anything. I appreciated how he was trying to encourage kids to follow their dreams and never give up. When the questions were over, the audience left and a group of kids stayed for a workshop. The purpose of the workshop was for the students to learn some of the skills Akil uses when he performs. TheaterWorks was asked to participate to act as role models. At first, many of the kids didn’t want to participate, but once we stepped up many of the kids did as well. After Akil shared his skills, we put on a little show which we only had fifteen minutes to put together. We were split into three groups: music, dance, and vocal. The performance was very powerful and we all had a great time.